52 | TH E M R EP O RT O R I G I NAT I O N S E R V I C I N G DATA G O V E R N M E N T S E C O N DA R Y M A R K E T THE LATEST DATA Consumers Say It's a Good Time to Buy and Sell A NAR survey reveals 72 percent of Americans believe it's a good time to buy a home, and 69 percent say it's a good time to sell. 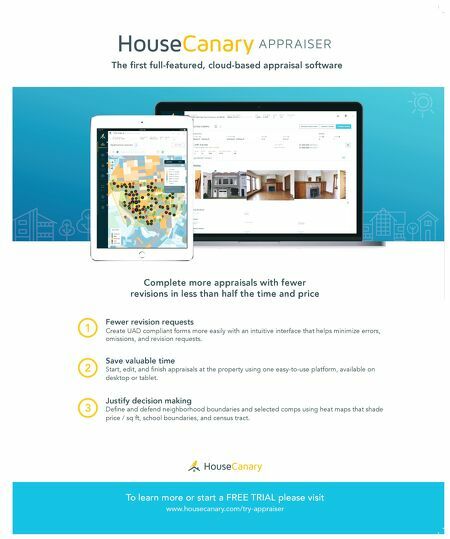 T he National Associa- tion of Realtors (NAR) released its Homeown- ership Opportunities and Market Experience (HOME) Survey for Q1 2017 in mid-March. This survey was created to moni- tor consumer sentiment about the housing market and will be tracked on a monthly basis. Topics monitored include views on housing as a good financial investment, whether homeown- ership is part of the American Dream, if now is a good time to buy or sell a home, and percep- tion of home price changes. Information obtained from the survey revealed these facts: Outlook on the economy: Of those surveyed, 62 percent said they believe the U.S. economy is improving. Of that number, 64 percent of respondents under 34 years of age believe the economy is improving, as well as 63 percent of those living in rural and suburban areas. Is now a good time to buy a home? The survey revealed that 72 percent said yes, with 47 percent believing that strongly. Only 28 percent believe that now is not a good time to buy a home. Not surprisingly, with rapid home price acceleration, those who are currently renting or living with someone else, those who are under 34 years of age, and those who live in urban areas are less confident that now is a good time to buy. Nearly four in five people who currently own a home, those over 55 years of age, those with incomes over $50,000, and those in the Midwest and South believe now is a good time to buy a home. 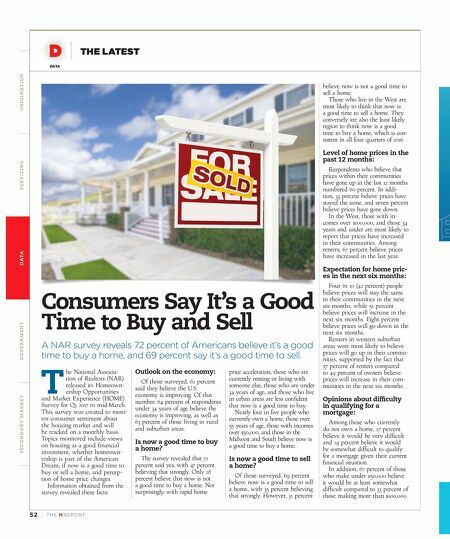 Is now a good time to sell a home? Of those surveyed, 69 percent believe now is a good time to sell a home, with 35 percent believing that strongly. However, 31 percent believe now is not a good time to sell a home. Those who live in the West are most likely to think that now is a good time to sell a home. They conversely are also the least likely region to think now is a good time to buy a home, which is con- sistent in all four quarters of 2016. Level of home prices in the past 12 months: Respondents who believe that prices within their communities have gone up in the last 12 months numbered 60 percent. In addi- tion, 33 percent believe prices have stayed the same, and seven percent believe prices have gone down. In the West, those with in- comes over $100,000, and those 34 years and under are most likely to report that prices have increased in their communities. Among renters, 67 percent believe prices have increased in the last year. Expectation for home pric- es in the next six months: Four in 10 (42 percent) people believe prices will stay the same in their communities in the next six months, while 51 percent believe prices will increase in the next six months. Eight percent believe prices will go down in the next six months. Renters in western suburban areas were most likely to believe prices will go up in their commu- nities, supported by the fact that 57 percent of renters compared to 49 percent of owners believe prices will increase in their com- munities in the next six months. Opinions about difficulty in qualifying for a mortgage: Among those who currently do not own a home, 27 percent believe it would be very difficult and 29 percent believe it would be somewhat difficult to qualify for a mortgage given their current financial situation. In addition, 67 percent of those who make under $50,000 believe it would be at least somewhat difficult compared to 33 percent of those making more than $100,000.